September 5, 2017 - Southwest Antennas, an industry leader in MIMO / MANET antenna solutions, is pleased to announce the introduction of two new C-Band RHCP & LHCP body worn patch antennas. These new antennas join their existing line of body worn antenna solutions, including options for L and S band radios. Designed to be light weight and easily worn and hidden in tactical clothing, these body worn antennas are ideal for use in multi-antenna MIMO / MANET radio applications such as handheld and small form factor body worn tactical radios. The products are housed in a rugged, waterproof UV stable polycarbonate radome and are built to withstand abuse in harsh operating environments and active situations. The antenna is sealed to withstand immersion in 20-meters (65.6 ft.) of salt water for two hours when the RF connector is mated or sealed with protective end cap. The antenna's radome measures only half an inch thick, and 2.2 inches in both length and width. A high quality and high performance black chrome SMA(f) RF connector is used to prevent corrosion when the product is exposed to high salinity environments for extended periods of time. Extensive field testing has shown that these antennas provides superior RF performance, ensure long range radio communication links, and provide high data rate throughput when used with MANET / MIMO self-forming, self-healing radio networks, or SISO radio systems. The antenna's directional RHCP or LHCP radiation pattern and axial ratio below 3dB offers robust network connections and allows radio systems to connect even when users are not directly facing each other or within clear line-of-site, helping to improve system performance. Users of multi-antenna tactical radio systems can utilize one antenna on the front of the body and one antenna on the back of the body, or in other 2x2, 3x3, or 4x4 MIMO antenna configurations in combination with additional body worn or vertically polarized omni-directional antennas. The body worn antenna's circular polarization properties also vastly improves terrestrial operation in all weather conditions. With an operating frequency range covering 4.4 – 5.0 GHz the design offers excellent performance in the DoD, Federal Law Enforcement, and NATO bands. The design offers +4.2 dBic peak gain when worn on the body and +4.5 dBic of peak gain when operating in free space making this product versatile and usable in both body worn and off body applications. The horizontal beamwidth of the antenna on the body is 104 degrees and it is 110 degrees when operating in free space. On the body the vertical beamwidth is 88 degrees and it is 90 degrees when operating in free space. In addition to body-worn applications, the free space performance of these antennas make them ideal for many field applications in point-to-point or multi-antenna mesh configurations, including fixed site infrastructure and mobile antenna applications. Available now from Southwest Antennas, these antennas can be purchased from their website, through an inside sales representative, or through an authorized sales representative or distributor. New MOLLE pouches are also available for these antennas, adding additional mounting options for users of tactical vests, bags, or other MOLLE gear. 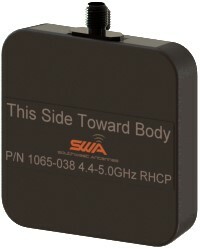 Also available are Southwest Antennas' complete line of body worn antenna options, covering ISM, L, S, and C bands.